Devout creatures of habit and ardent practitioners of unvarying routines, some gentlemen demonstrate a certain predilection towards sartorial monotony. In other words, they gradually gravitate towards what is fashionably comfortable and they never depart from that orbit. And nothing symbolizes comfortable, safe certainty than cotton. Residing amongst all of his personal furnishings, cotton rules because cotton is king. Cotton shirts. Cotton pants. Cotton socks. However, there are moments when a gentleman should be encouraged to pivot towards other fabric choices. And let us not take the easy way out by turning focused attention to our trusty wool coat; that should be a given heading into the chillier part of the year. But, we are on the right track here. Wool is great, so let’s apply it to an accessory that is usually cotton – the pocket square. Here are six pocket square selections to glean inspiration. Enjoy. 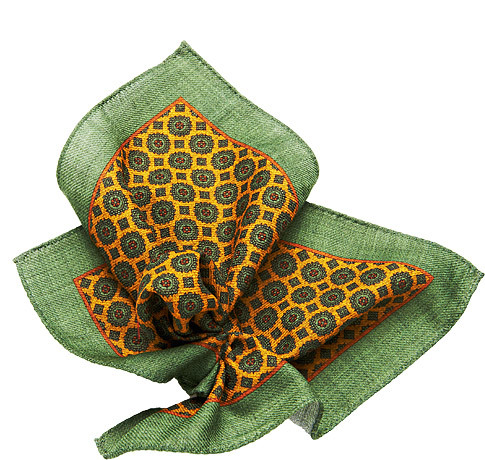 Wool pocket squares have been a favorite of mine for quite some time now. I actually own the pocket square pictured above. Seriously, you should join the club. Check out my online post for UPTOWN Magazine and see why. Oh, yes, that can be found HERE.